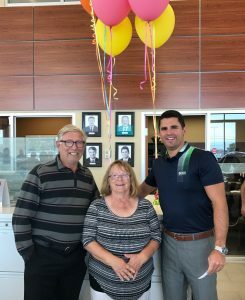 On Tuesday, August 29th, customers returned to Northside Toyota to witness the live draw for the ‘Dream Trip For Two’ contest that was part of Northside Toyota’s Summer Salebration Sale held August 22nd-August 25th. Brian and Beverley not only get to enjoy their brand new Toyota Tundra, they now get to enjoy a dream vacation thanks to Northside Toyota. You can view the live video on our Facebook Page. Every new lease or purchase made during the sale entered customers to win the contest, ‘A DREAM TRIP FOR TWO ANYWHERE IN THE WORLD’. The prize will be awarded with 200,000 Aeroplan Miles (enough miles for a dream trip for 2). The couple already have big plans for their dream trip and mentioned Bahamas or Hawaii as possibilities. Happy planning, safe travels and congratulations from the entire Northside team.